Hi friends! You are in for another Halloween treat! Meet Jody, a dear collector friend who is sharing a peek inside her decorated home. We met about 7 years ago when I was exhibiting at the Halloween & Vine in California. An artist feature in Better Homes & Gardens Tricks & Treats Magazine was the catalyst that brought us together! I recall her excitement to meet me and to see my works in person. It was her enthusiasm, like that of so many others, that fueled me forward with my passion to make vintage-style art that expands the imagination and generates smiles. Jody has an affinity for both my one of kind original characters as well as my licensed designs, and she weaves them together in her thoughtful arrangements. She also collects the art from fellow Halloween artist friends, and it is a delight to see how our individual styles compliment one another. For me, it is a pleasure to share her collection of photos with you! I am honored that my art has captured her heart and the fancy of her family and friends. Many thanks goes out to Jody for inviting us into her beautiful home, and inspiring us to celebrate the season in this most whimsical way! Let's begin with an Artist & Collector Q&A that will meander along the way. Enjoy! Jody: I was thumbing through a magazine in search of decorating ideas for an upcoming Halloween party I was hosting when I spied an article about you. There were pictures of your beautiful home and originals, as well as adorable “Jack”. I instantly fell in love with your artwork. I soon purchased a few of the pieces featured in that article. The moment that I received my first JP original, I was hooked and traveled to a show to meet you in person and acquire more of your Halloween originals. 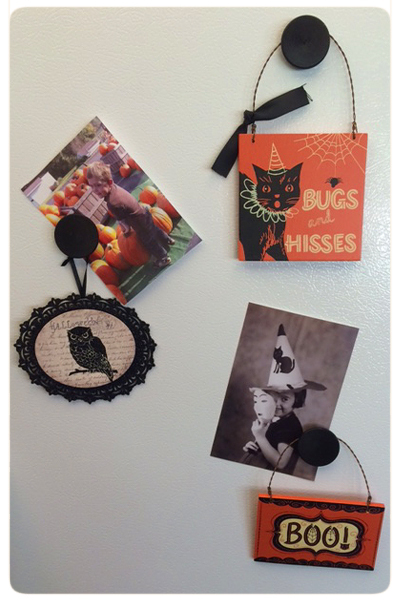 My Halloween party ended up with lots of JP whimsy incorporated into the theme, and your originals were a big hit. 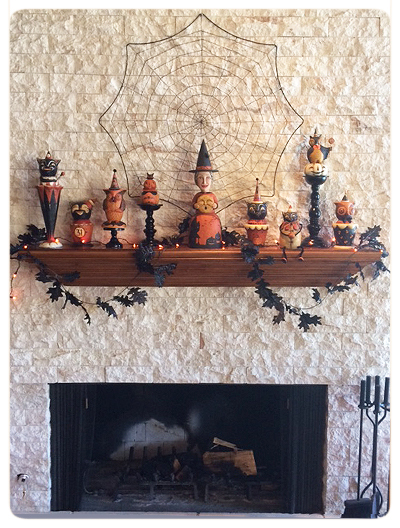 * Jody's white stone fireplace and wooden mantel are the perfect backdrop for a Halloween display! A simple spider web sets the scene for a cast of spooky characters! She weaves a glittered garland of black leaves and orange glowing lights to add texture and whimsy to the line-up of collectible figures. * Across the mantel, two original black cats, a candy container and shelf sitter, look as if they are whispering a "BOO." Cats by Johanna Parker Design. Jody: I have been collecting your originals since 2007. My first one, named “Unruly Rosco”, was purchased from an online sale. His spooky expression warns of tricks ahead. I then attended the Halloween & Vine show later that year. I had never been to a Halloween show before, and it was overwhelming! :) Meeting Johanna and JP was the highlight. I have been attending Halloween art shows ever since. Through the years, it has been a pleasure to watch your business grow leaps and bounds. I still enjoy finding your products at local stores and seasonal events. I just attended a harvest craft festival in Costa Mesa. There were several booths selling your new and older Halloween items. J: Before I found my path as a Halloween folk artist, I was not aware that there were Halloween art shows. But since I found my niche, I realized that there are dozens of these special spooky markets across the country. What fun that JP and I were the highlight for you at your first H&V show! I am honored… It's fun that you continue to frequent some of these art festivals and often come across my licensed designs! It's like going to a Halloween treasure hunt! * At left we see "Unruly Rosco," perching proudly on a black pedestal. Back in 2007, Jody spotted him in my arched wall niche, featured in Better Homes & Gardens and there, this Halloween collecting story began! She has him grouped within a gallery trio that spotlights each character. 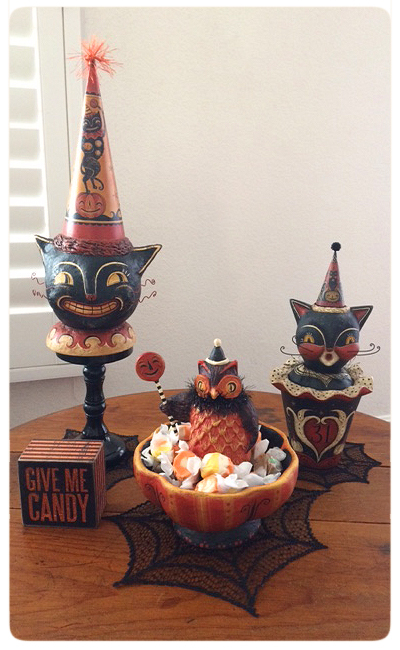 In the middle, my reproduction owl candy bowl, from Bethany Lowe Designs, tempts those with a sweet tooth. At right stands "Spirited Tess," one of Jody's newest acquisitions from my 2014 collection of originals. The three are grounded with black spider web coasters that offer more impact and definition to the display. 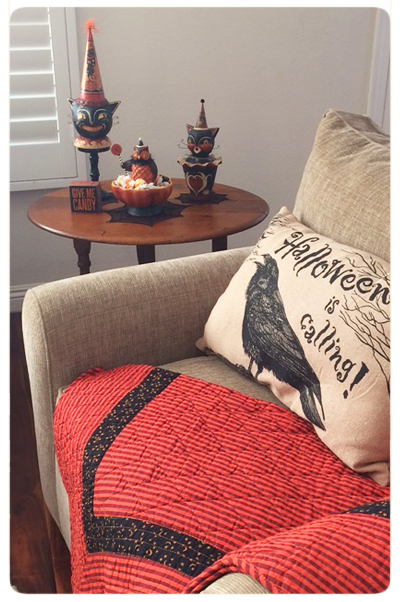 * As we step back, a comfy seat with a Halloween throw and crow pillow look oh so inviting! Take a seat and savor the Halloween delights! 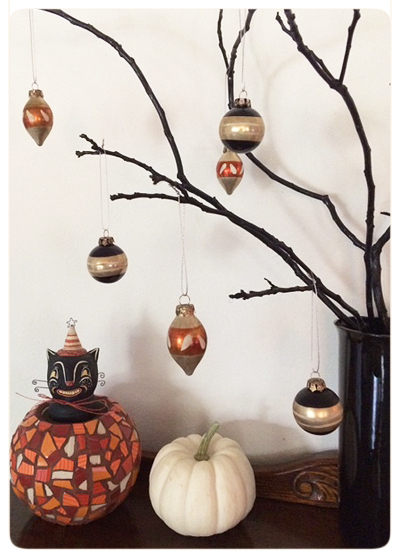 * A side table twinkles with Halloween baubles dangling from a cluster of artfully arranged branches in a vase. An orange-themed mosaic bowl that Jody crafted is the perfect vessel for a Johanna Parker Design reproduction black cat. He peers off to his side, captivated by the ornaments! Jody: A year has rarely passed during my life without a Halloween party, movie night, or get-together of some kind. For my family, Halloween has always been about fun, imagination, tradition, and parties. Your work embodies all of these aspects. Each character looks like it is ready to celebrate! 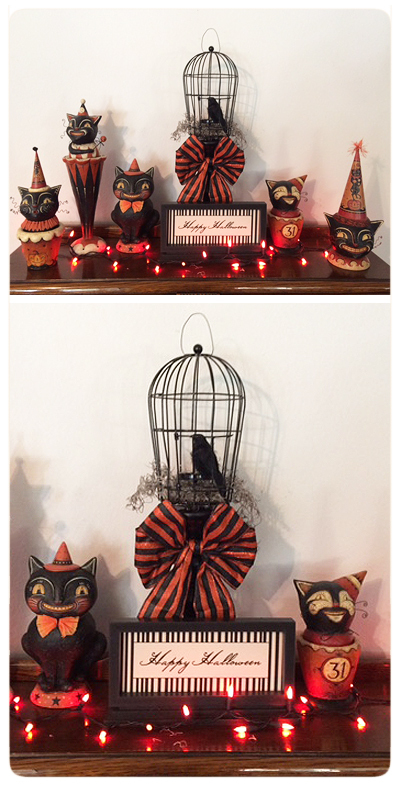 I am a fan of art deco and vintage Halloween decor. Your little vintage details are exceptional and harken back to an old story. In fact, each one looks like they have walked out of a tale. I also appreciate that you infuse a sense of humor into your work, aesthetically and in their names. The clever, old-fashioned names are half the sale for me! Whenever I am at one of your events, I try to read the names of each piece. I guess it brings them to life even more. Your creations make me smile. 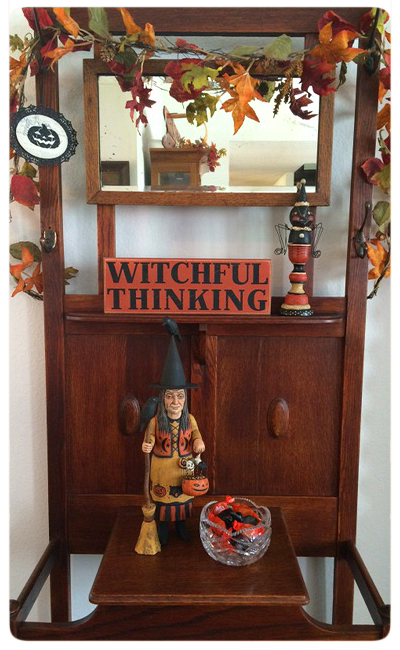 * A Greg Guedel witch guards a bowl of candy and welcomes guests with a little "Witchful Thinking!" A garland of autumn leaves festoons this antique hall tree and frames the scene. * A closer peek reveals one of my reproduction candlestick spiders, crouching on the ledge. These spooky guys are still available via Bethany Lowe Designs. Jody: I have acquired originals in different ways but have had the best luck acquiring originals by attending shows and with web sales. I highly recommend attending shows to anyone as it’s great to be able to chat with Johanna and other obsessed collectors. J: I agree, the shows are probably the best way to see a broader collection of my originals in one place. And of course, I prefer that path above all others because I have the opportunity to meet wonderful people like you! 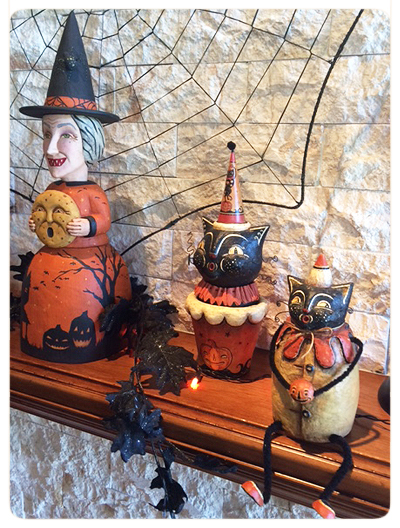 Speaking of, it was a treat to see you at this year's 9th Annual Halloween Trunk Show! Thank you for making the journey to come out and see us again!! 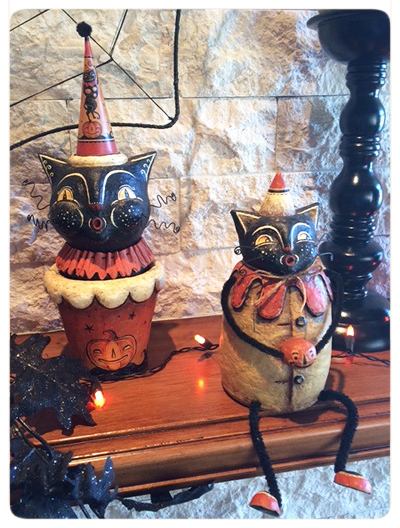 * Returning to the mantel, we see two original characters that Jody collected at the Denver Halloween Trunk Show a few years back. 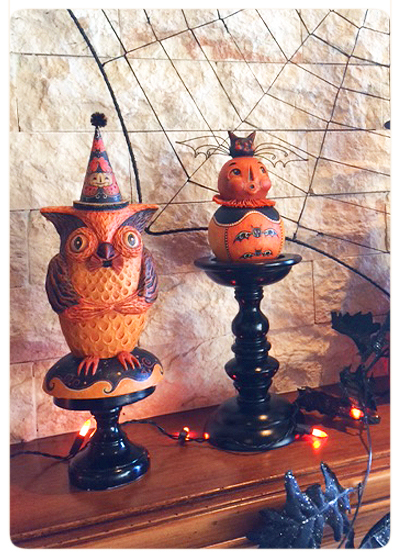 A perching owl and a jack-o'-lantern with a bat hat, both roost atop black candlestick pedestals and make a spooktacular pair! Owl and Jack are originals by Johanna Parker Design. 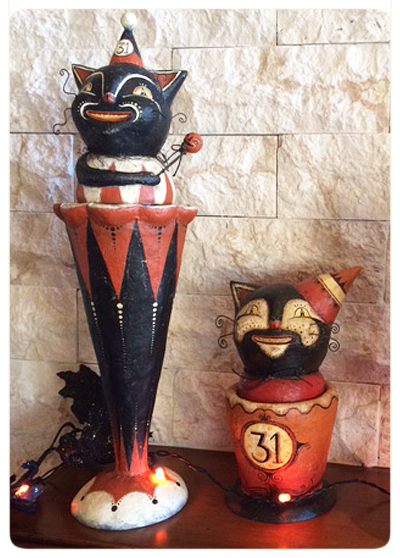 * Another view of Jody's mantel reveals a large grinning witch by Greg Guedel, standing center stage! Jody: That’s tough! They are all so fun….If I HAD to pick a favorite, I would say that the black cats are my favorite, maybe ‘Black Paw Pocus’ or ‘Spirited Tessa’. Black cats are synonymous with Halloween, and yours look especially mischievous. There is a very close margin, though, with the rest of the characters. J: I knew you were going to choose a black cat or two from your collection of characters! Clearly, we both have an affinity for these cuties. And indeed, my black cats certainly do possess a mischievous air about them. * Towering on the mantel's end is "Black Paw Pocus"- one of Jody's faves! 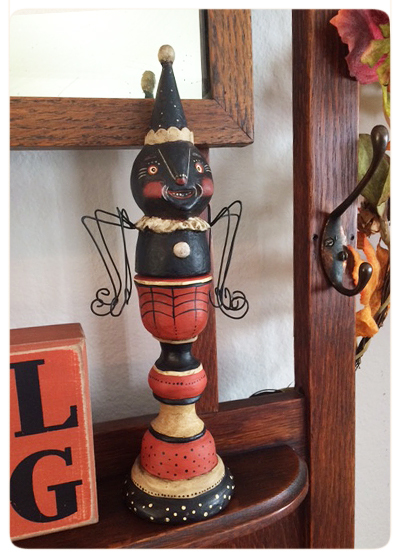 He proudly perches in a hand-sculpted base chamber vase and carries a pumpkin scepter. 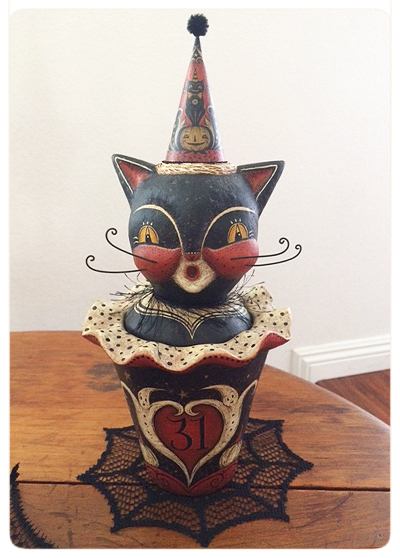 His buddy black cat candy container friend shares a grin and wears a number 31. Both are original candy containers by Johanna Parker Design. J: Hmm, I am getting the hint indeed.. Gosh, it's been several years since I made an orange cat! Thanks for reminding me as those would be fun to make next year. And, I agree, and orange cat base chamber vase would be stunning. Feel free to "bug" me from time to time, and perhaps we can add one to your collection…. * I got a laugh seeing this clever arrangement ~ a caged crow surrounded by a group of my cats! Hehe!….. It's fun to toss in some humor while adding decor to the home. Is it just me, or do the cats look like they are up to trouble? * And, Jody's Halloween spirit extends to the bath as well! 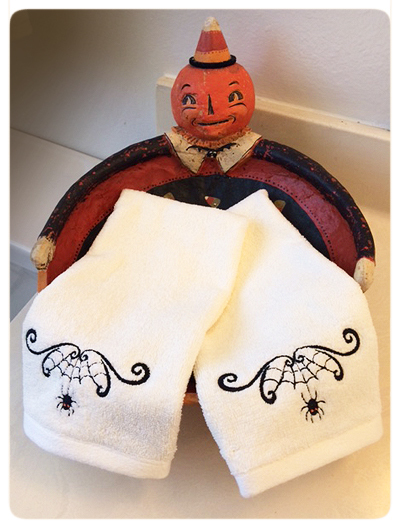 Ivory towels with spiders with webs invite a visit to this intimate space. 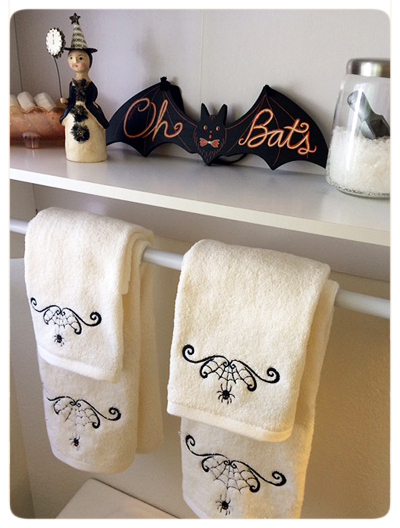 A shelf above, carries out the haunting theme with a Nicol Sayre witch figure and one of my "Oh Bats" signs from my new line of vintage style Halloween via Primitives by Kathy. Well, that was a delightful visit into Jody's home for Halloween! I really enjoyed the Q & A, and her inspiring arrangements in the spirit of our favorite holiday. Again, it is such a pleasure to see my art taking up residence in her lovely home. It makes me happy to see these creations filling out there mission to bring smiles, year after year. Thank you for cherishing them, and thank you for allowing us to visit your warm home! To leave a message for Jody or myself, please click on the "comments" link at the bottom of this post. Thank you!